Special agents with the Department of Public Safety and Texas Anti-Gang investigators arrested eight people in Levelland this week, including two confirmed gang members. A source with DPS told the News-Press that special agents ran a search warrant at a residence at 219 Poplar Street around 1:15 p.m. Thursday. They arrested three individuals as a result of the search warrant. Wednesday, investigators with the Texas Anti-Gang unit were in Levelland conducting traffic stops. They participated in two vehicle pursuits and arrested four people. Monday, around 2:15 p.m., TAG investigators conducted a traffic stop on a vehicle in Levelland at the area of 9th Street and Avenue C.
They arrested a man after they located a loaded 9mm handgun under the front driver’s seat. Investigators also found him in possession of more than $4,000 in cash. Investigators secured a search warrant on the man’s phone and found evidence of drug trafficking activity, an investigator told the News-Press Thursday. He was jailed for money laundering and felon in possession of a firearm, both state jail felonies. He posted bonds of $60,000 for the money laundering charge and $10,000 for the felon in possession of a firearm charge Tuesday. Investigators say the man is on parole for manufacture, delivery, of a controlled substance. The more than $4,000 in cash was also seized by agents as part of the investigation, a source with DPS said. 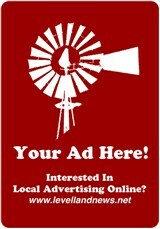 The full story can be found in the weekend edition of the News-Press. Copyright, 2019. 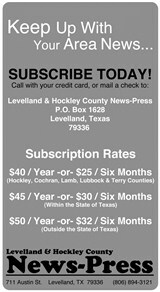 All rights reserved, Hockley County Publishing Co., Levelland & Hockley County News-Press. This material may not be redistributed, published, rewritten or broadcast without permission.